(APN) ATLANTA — As the 2017-2018 General Assembly Legislative Session quickly approaches in Georgia, Atlanta Progressive News is re-issuing our Combined Scorecard for 2014, 2015, and 2016 for legislators in the State House and Senate representing areas wholly or partially in Fulton and/or DeKalb Counties. 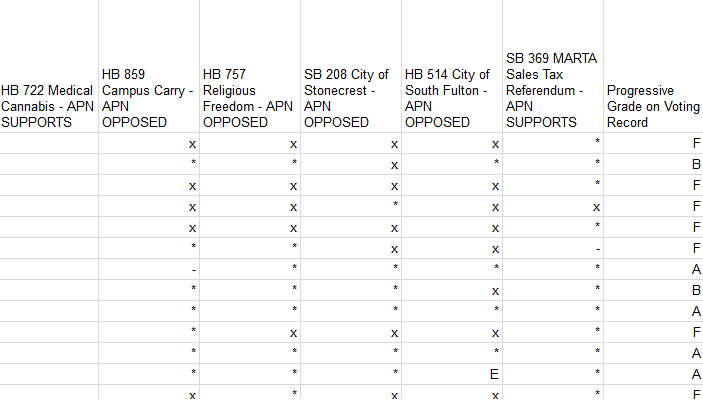 The Scorecard rates the candidates on the progressiveness of their voting records, based on legislative matters covered by Atlanta Progressive News, and whether their votes aligned with APN’s editorial stance on those bills. Previously, APN issued its 2014 and 2015 Legislative Scorecards. While we believe our editorial positions, which inform the scoring of the votes, reflect progressive principles of justice, readers are free to use the data underlying the Scorecards to develop their own grades. This year, we focused on six bills that concerned topics including cityhood movements; the so-called “religious freedom” to discriminate or not follow laws; medical cannabis; a new MARTA transportation sales tax referendum; and the “Campus Carry” bill that would have allowed for students over the age of twenty one to carry licensed handguns on public university campuses to name a few. Senate Democrats appear to have stuck together in regards to the Campus Carry, allowing for a MARTA sales tax increase referendum, and Religious Freedom proposals; however, they were split on the issues regarding cityhood. Senate Democrats, in general, stick together much more than House Democrats. Though the Medical Cannabis bill did not receive a vote in the Senate, it is interesting to note, that of those who voted in the House delegations, only one Democrat, State Rep. Roger Bruce (D-Atlanta), and one Republican, State Rep. Brad Raffensperger (R-Johns Creek), voted against the measure. The Campus Carry legislation did not receive one Democratic vote in the House or Senate delegations. The Religious Freedom legislation did not receive one Democratic vote in the House or Senate. In the State Senate, five Democrats scored one hundred percent, including State Sen. Nan Orrock (D-Atlanta), Vincent Fort (D-Atlanta), Steve Henson (D-Atlanta), Elena Parent (D-Atlanta), and Gloria Butler (D-Atlanta). The perfect scores are cumulative – meaning one hundred percent for the years 2014 to 2016. 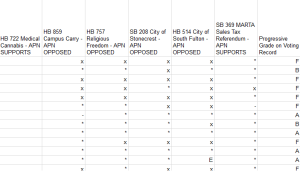 On the other hand, State Rep. “Coach” Earnest Williams (D-Atlanta), who defeated a primary challenger in May, was absent from voting on five of the six bills APN has chosen to grade. The absences were not weighed in his score of zero, although we disagreed with the one scored vote he took. Rep. Williams, in fact, is the least progressive legislator out of both delegations, when looking at 2016 by itself. Ironically, the most progressive House Democrat over the last three years has been State Rep. Rahn Mayo (D-Decatur), with a score of 87.5. However, Rep. Mayo did not participate in many controversial votes, a fact that Primary challenger Renitta Shannon used to successfully unseat the incumbent earlier this year. For example, his score this year does not include votes on Medical Cannabis or two of the three Cityhood proposals. In the House delegations, there is a full range of scores, from very low F’s, to high D’s, among Republicans; and from low F to A, among Democrats. The most progressive Republicans were State Rep. Beth Beskin (R-Atlanta), with a high D, or a score of 67; and former State Rep. Joe Wilkinson (R-Sandy Springs), who has retired from the legislator, who also scored 67. Both scored higher than numerous Democrats in the delegations. Even State Rep. Tom Taylor (R-Dunwoody), who scored 60, scored ahead of several Democrats. CORRECTION: An original version of this article identified Rep. Beskin at one point as a Democrat in a parenthetical; however, it has been corrected to state (R-Atlanta).